Mimosa hour, brunch reception and waterfront views = PERFECTION! We love to please! Whatever your wedding dreams are, we got you covered! Stephanie and Justin’s waffle bar was surely a unique crowd pleaser at their reception. 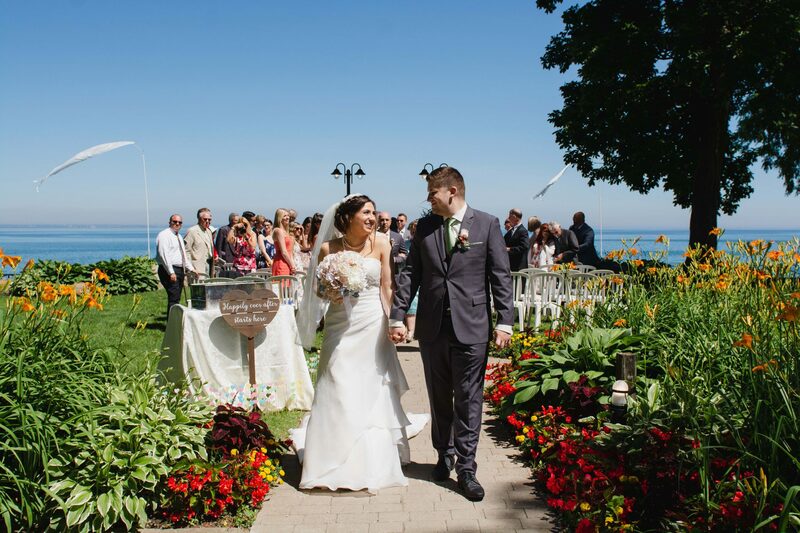 We recently caught up with Stephanie who talked about how our waterfront views and lush gardens gave them that destination wedding vibe that they were hoping for and how their magical day received rave reviews! Inspiration for your special day? We were originally planning a destination wedding. 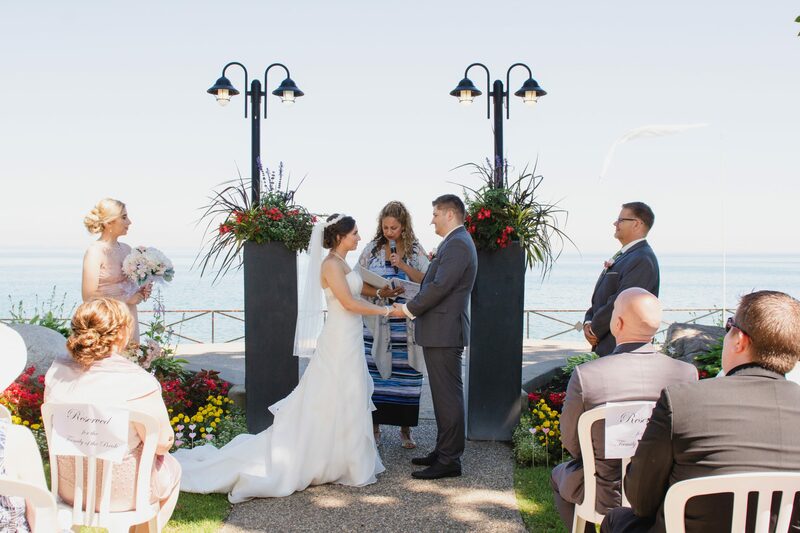 When we made the change to stay in Ontario, we didn’t want to give up that “outdoor ceremony by the water” dream. LIUNA Gardens gave us the best of both worlds and looking back at our pictures, you’d question whether or not we were in the Caribbean. Favourite part of your day and why? The whole day truly was perfect. An early start with an 11am ceremony followed by photos, mimosa hour and moving right into the brunch reception, we couldn’t be happier with how the day panned out. That said, the best part of our day would probably be the ceremony. Justin and I were both worried about the sun, the possibility of ourselves and our guests sitting and sweating as we said, “I Do”. Luckily, Mother Nature was on our side and while the sun glistened, we were shaded in by the gorgeous greenery of the gardens. Did you customize your menu or use one of our yummy, pre-crafted selections and the best part of your meal? We customized the brunch menu to cater to all of our dietary desires and restrictions. Some of our guests were gluten-free, dairy-free, and even vegan so we wanted to make sure there was something for everyone! We included on the Waffle Bar with all the fixings, and it was definitely the best decision we could make. They were a HUGE hit! How were our onsite coordinators? 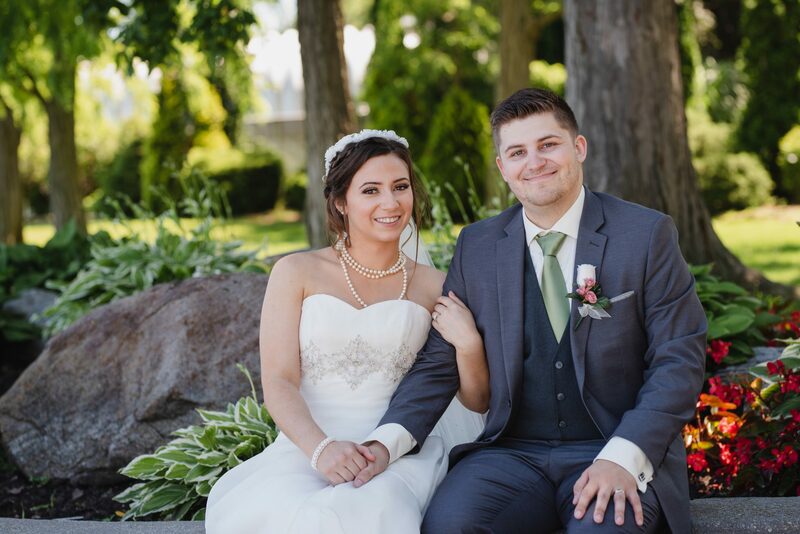 We had meetings with both Nicole and Robert as we planned our wedding at LIUNA Gardens. They were both extremely helpful in every aspect. We both appreciated the efforts made to make our dream wedding happen. Salomon was our day-of coordinator and he was on top of everything! We met with him the day before the wedding and went over everything and from the minute we walked in, we felt completely at ease. On our wedding day he was great at making sure everything was to our liking, problem solving any bumps and keeping us on schedule to have the perfect day. From the moment we walked in for a venue tour, we were greeted with smiles and kindness (something we really needed after the day we had had). The front desk receptionist gave us a tour and walked us through possible options for the kind of wedding we were looking for. Our wedding was definitely on the smaller side and one of the main issues we ran into while planning was that we didn’t meet the minimum guest requirements to make it “worth it” for venues to host our day. The second issue, other venues said it was impossible to serve breakfast food at the reception. With LIUNA, they assured us that they could accommodate our wedding size and that our menu was completely customizable. This high level of service continued to prove that we couldn’t have chosen better than LIUNA Gardens. What about the LIUNA experience would have you recommend them to another engaged couple? A big thing for us going in, was that we knew we had several dietary restrictions that could become problematic with the menu. They quickly let us know which items would no longer be possible and offered many alternatives to replace them. Every part of the planning process with LIUNA was never a question of what couldn’t be done. Instead, it was always positive and always full of options to make our day unique to us and cater to our needs. Was your special day everything you had expected it to be? SO MUCH MORE! We could not be happier with how the day unfolded! All of our vendors provided us and our guests with exceptional service, and it shows when you continue to hear months later of the great experiences our guests had with us. In five words, how would you sum up your whole experience with us? FLAWLESS from top to bottom! Floral Arrangements: Handmade using faux and silk flowers from Michaels and past brides. Transportation: Celebrity Limousine Wedding Dress: Marilee’s Bridal Groom’s Suit: RW & Co.